Mark Twain's letters for 1874 and 1875 encompass one of his most productive and rewarding periods as author, husband and father, and man of property. He completed the writing of The Adventures of Tom Sawyer, published the major collection Sketches, New and Old, became a leading contributor to the Atlantic Monthly, and turned The Gilded Age, the novel he had previously coauthored with Charles Dudley Warner, into one of the most popular comedies of the nineteenth-century American stage. His personal life also was gratifying, unmarred by the family tragedies that had darkened the earlier years of the decade. He and his wife welcomed a second healthy daughter and moved into the showplace home in Hartford, Connecticut, that they occupied happily for the next sixteen years. 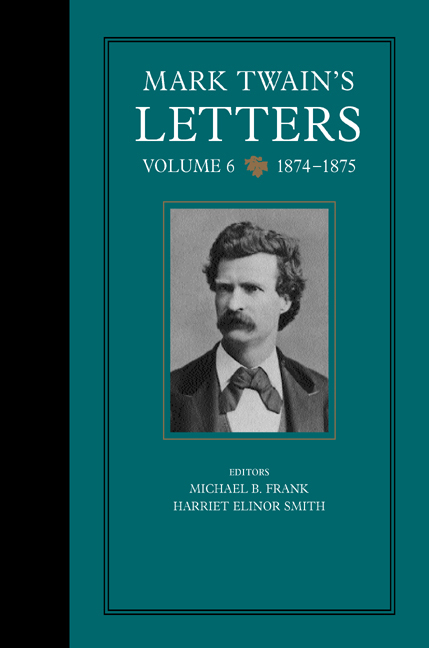 All of these accomplishments and events are vividly captured, in Mark Twain's inimitable language and with his unmatched humor, in letters to family and friends, among them some of the leading writers of the day. The comprehensive editorial annotation supplies the historical and social context that helps make these letters as fresh and immediate to a modern audience as they were to their original readers. This volume is the sixth in the only complete edition of Mark Twain's letters ever attempted. The 348 letters it contains, many of them never before published, have been meticulously transcribed, either from the original manuscripts (when extant) or from the most reliable sources now available. They have been thoroughly annotated and indexed and are supplemented by genealogical charts, contemporary notices of Mark Twain and his works, and photographs of him, his family, and his friends. Michael B. Frank and Harriet Elinor Smith are both members of the Mark Twain Project of The Bancroft Library at the University of California, Berkeley.